Data Visualisation and Information modelling is emerging as an important field of design action and in the age of media and computer based interaction the opportunity to make data visible is both an art as well as a science that needs to be used in all walks of life as well as in the core offerings from business and governments alike. This blog called "Visible Information India" is therefore a platform that will be used by students in the Data Visualisation class at the National Institute of Design in Ahmedabad and Gandhinagar to share and showcase their ongoing efforts with their teachers as well as with others interested in taking this new activity to a higher level of professionalism. This course was created three years ago with the first batch of students from the new digital design disciplines at NID and it has been found useful for other groups as well as by the industry representatives who had come for the placement activity at the end of these programmes. This year, the two week course is conducted by Prof. M P Ranjan and Rupesh Vyas at the Gandhinagar campus for students of the Information and Digital Design discipline (IDD). The first assignment given to the students is the analysis of modelling data flows on the Google Analytics service as they are applied to the design of institutional and personal websites and we hope to see this work documented and shared in near real time during the conduct of this course at NID. 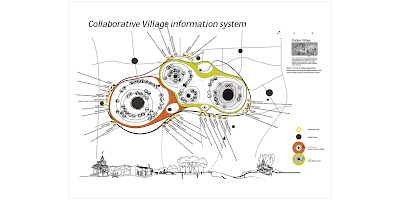 Experimental assignment done last year on mapping village resources for use by local people in a village near Gandhinagar. Through this platform of, "Visible Information India" blog, the faculty will also share their insights and comments on the emerging field as well as post book reviews and discussions on current developments that may be pertinent to the subject at hand, making critical and useful information visible for and in India. This resource will cover design approaches for the creation of maps, models and diagrams as well as dynamic data representations of a number of domains such as financial, medical and decision support, to mention only a few. Its a commendable effort to visualise information in daily life to map out resources, factors and influences. I see this as a very powerful tool that can actually be used myriad ways. I am eager to see how this class goes, its a nice example of how design can also become a political driver as well as a process tool.